Belle Harbours Walking on Sunshine at Bear Acres - "Jenny"
GCH CH Old Bay's Cool Hand Luke at Belle Harbour "Luke"
CH Belle Harbours Agent Extraordinaire - "Ziva"
GCH CH Voldemort at Chekrd des Oursons du Vent - "Doby"
CH Avalon Bey's Dante's Rainbow "Bo"
CH Belle Harbours Don't Tell Me What To Do at Bear Acres "Tilley"
CH Belle Harbours Lily on Seas of Dark "Lily"
GCH Belle Harbours Radiant Mariner "Zara"
GCH CH Chekrdflags French Kiss for Belle Harbour "Meg"
GCH Belle Harbours Vipers Choice "Maverick"
GCH Belle Harbours Chattanooga Chew Shoes "Gabby"
CH Cypress Bays Frozen from MtnToSea to Belle Harbour "Annabelle"
GCH CH Belle Harbours Sweet Sensation "Jelly"
Bo crossed the rainbow bridge in 2014. We miss his joyful personality every day. was a top 20 dog and a Specialty show winner. He also won the top 20 at the 2008 nationals. He has several children and grandchildren to help him live on. Below I have outlined just a few of the factors that go into the purchase price of a Belle Harbour Newfoundland Puppy. These costs are PER Dog. 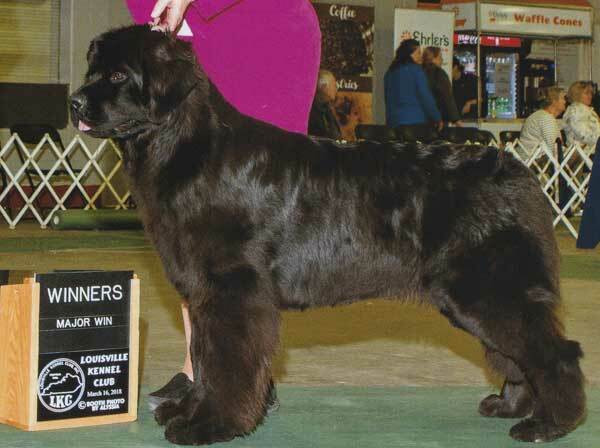 great care in insuring that you are getting a healthy puppy who will be an excellent example of the Newfoundland breed. At Belle Harbour we take our responsibility as breeders seriously. Factors that affect puppy prices. Veterinarian evaluation with vaccine record for your new newfoundland puppy (first shots will have been given). Cardiologist report showing your newfie puppys passing evaluation. Documentation on current health issues for newfoundland dogs so that you can make informed decisions for your newfy puppy. Flea, Tick and Heartworm preventative ( we use nexgard for fleas and ivermectin for heartworms). Home Again Microchip already inserted and ready to be registered. A collar and starter food to get you by until you can order more. Worming record. Your newfie puppy will have been wormed several times when he/she leaves our home. AKC new puppy packet which includes instructions on potty training and socialization tips, health research and much more. A well socialized newfie puppy ready to be part of your family. A Contract including guarantees on hips, elbows and heart defects. Our commitment to always be there for you for the lifetime of your newfie. what your puppy has been eating so that you can keep him/her healthy. A Wire and/or slicker brush. You will need $2000 cash to complete the transaction. wholesaler. To be a wholesaler you must breed six or more litters a year, we do not breed often enough to qualify. fly here and make your own airline arrangements for you and your new puppy. The transaction must be face-to-face. before you send a deposit. You will receive an email approval when your home is approved. Step 1. please fill out our application. Step 2. you will get an email from us telling you of your approval. Reply to the email confirming you would like to be added to our list. Step 3. you will receive notification when the puppies are born and you can send in your deposit. post pictures of the puppies. setup an appointment to pick your puppy up. IF AT ANY TIME YOU WOULD LIKE TO BE TAKEN OFF OF THE LIST CLICK THE UNSUBSCRIBE LINK IN THE NEWSLETTER EMAIL.